My two boys, enjoying the cool autumn days! He is a Crossbreed, part Pomeranian and part Lhasa Apso x Tibetan Spaniel. There you are!!!! I've been waiting & waiting for pics.. goodness, Chibi's so big now!! You have two very handsome boys now!! I actually see more of the TS in Chibi, whereas before he looked A LOT like a Pom. Puppies change a lot when they grow!! Lovely brothers! Great looking pair! oooh, den lilla har vuxit och du har uppgraderat dig med en ny fin signatur, snyggt! Oh my god look at how big Chibi has gotten! He is so cute still. And Zodd, how I love him so. Chibi's not so chibi anymore hahaha. He's still cheeky and demanding it seems. I'm probably going to go to my very first dog show this November. I really, REALLY hope I'm able to go. Chibi has gotten so big! He's turned into a very unique looking dog. Zodd is still as handsome as ever. You're welcome. 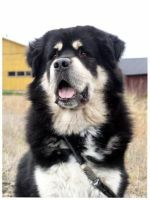 And hehe I agree, he's just so adorable C: Looks like he's full of energy and then Zodd is just the opposite lol ^^ Zodd is an amazing looking dog though ^^ I still would love to get a T-Mastiff eventually. Aww Chibi's growing up! They're both so beautiful! Wow, Chibi has grown a lot! His fur colors are so beautiful, a very unique pattern of spots! He will turn 1 year next week! The last picture I saw, he still had that puppy face But he's still so pretty! Cake is still a good option! I am a really big fan of Zodd.